Myanmar is an unforgettably astonishing country. Dense with wild forests, blanketed in bright green hills and valleys and snow-tipped mountains. The country is rich in precious gems and jade and has coastline waters to match. Don’t miss the polished blues of the encompassing Bay of Bengal and Andaman Sea. Myanmar situates itself next to India and Bangladesh to the west, with Thailand to the east, and China above. It’s as ancient as any other country in Southeast Asia, but blessed with over 1,200 miles of uninterrupted coastline and sprawling landscapes. What are you waiting for? Board your luxury charter, Myanmar waits—and there’s much to do. While charter in Myanmar, you’ll come across brightly colored fishing boats amongst floating villages. At its edge is Phaung Daw Oo Paya, a tiered pagoda with serenely gilded Buddha statues. If you make your way near Nyaung Ohak, you will be rewarded with the discovery of ruined stupas – where the passing time has melded the ruins into the clutches of the surrounding forest. Mount Popa towers just shy of 5,000 feet, a volcano covered in rich biodiversity, and at its summit lays temples and relic sights. The journey itself is a mark of pilgrimage to its famed monastery. Less daunting of a climb is Mandalay Hill, where you will ascend 790 feet on one of its four covered saungdan (stairways) to catch a glimpse of the staggering summit views. Be sure to say hello to the giant white chinthes (stylized lion statues) standing guard at the southern foot of the hill. Explore and see more than 2,000 temples and pagodas across the nation. In this country, it isn’t the case of “you’ve seen one pagoda, you’ve seen them all,” each are distinct pieces of architecture and a pertinent reflection of their surrounding culture, village, and era. They’re Myanmar’s voice – spoken through carefully laid brick, elaborately designed structures and religious symbols. There is a plethora of temples, too. Thatbyinnyu Temple will not disappoint. The imposing Buddhist temple stands in its ornate 12th-century construction at 201-feet tall—the tallest there is in Bagan. Htilominlo Temple. The elegant Sulamani Temple in the village of Minnanthu is one of the most widely visited. Built in 1183, its interior is endowed with delicate frescos, and its exterior reflects Myanmar’s common theme of complex symmetry, ornate designs and stately embellishments. Myanmar’s capital is bursting with life. Naypyidaw will show you the stuff that Myanmar is made of. The city is the seat of its national government -home to the Union of Parliament, the Supreme Court, the Presidential Palace, and the Cabinet of Myanmar. Spend your days shopping at the bustling Naypyidaw Myoma Market or Unction Centre Naypyidaw. Head outdoors for a stroll through Ngalaik Lake Gardens – a small water park along the scenic Ngalaik Dam. The food of Myanmar is nothing short of irresistible. Midday, as you begin to feel hunger encroaching, pick up a tea leaf salad. It’s refreshing, with a slight bitter edge to keep you motivated. The tempting spicy aromas of curry will entrap you—pork, fish, shrimp, beef or mutton. And it’s not Myanmar without rice, eat it shan-style, cooked with turmeric, topped with fish and garlic oil for a punch. Dive into serenity with a visit to the peaceful U Bein Bridge, a wooden footbridge erected in the 1850s with teakwood pillars and planks. For something more ancient, make a trip down to Pindaya Caves, where thousands of images of the Buddha will greet you as you make your descent through this pilgrimage site. Dating even further back in its origin is the Nga-htat-gyi Buddha Temple, a breezy temple in Yangon that houses a twenty-foot Buddha donated by Prince Minyedeippa in 1558. Spend a day relaxing at Red Mountain Estate Vineyards & Winery, where you can taste the fruits of Myanmar’s labor with a swirl of a wineglass. Hike Nat Ma Taung, a monstrously high mountain that spans three townships. For less exertion – choose Inya Lake, where you can sail the tranquil waters during sunset. 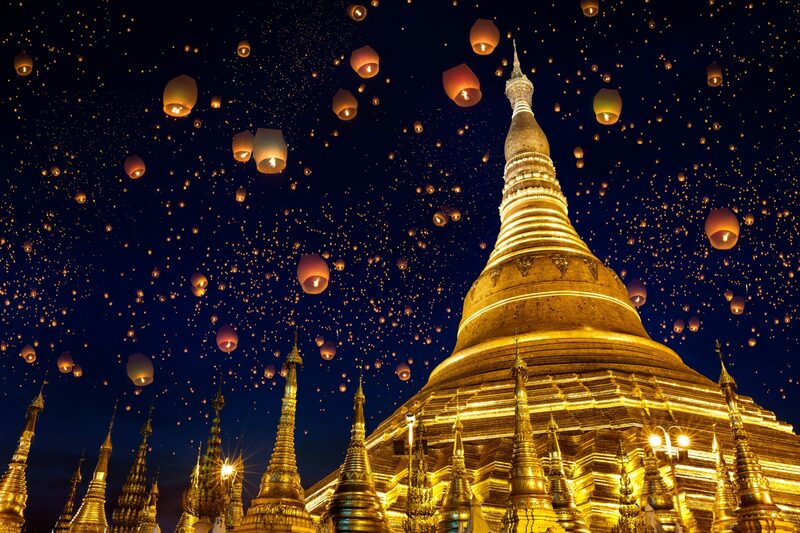 Myanmar is bursting with diversity, peaked with pagodas, and brimmed to the top with temples. Navigating this magnificently beautiful country means delving into centuries-long human history, one interwoven with touches of its spanning areas, each structure, relic, and artifact like a fingerprint in its unique design. Visiting Myanmar is transforming because the nation itself is so.